Fitzroy-ACU Women 1 will come up against the highly-fancied St Kevin’s tonight at Victoria Park, with both teams coming off convincing round 1 wins. The Round 2 action in the Wilson Women’s Premier competition will start under lights at 7.20pm (please note the time change). 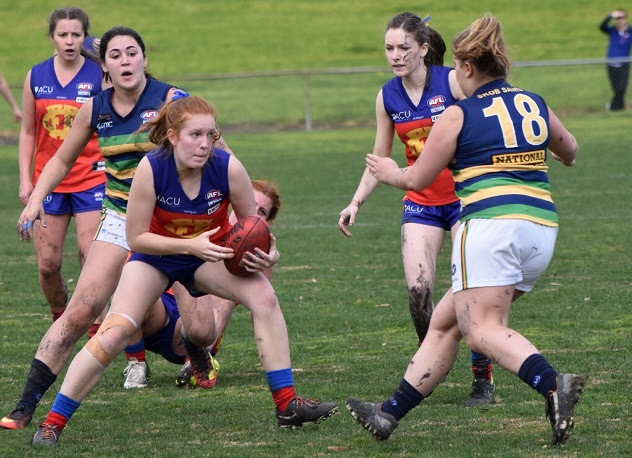 St Kevin’s will be keen to avenge their semi-final loss to Fitzroy-ACU in the VWFL finals last year and looked strong last week with a big win over AJAX. The Roy Girls were just as convincing with a good result against Brunswick Renegades. All the games are crucial in these first three grading weeks of the VAFA Women’s competition, as the teams take their points (but not percentage) into the rest of the season once each division’s makeup is decided. So head on down to Vic Park tonight and lend your support to Fitzroy-ACU. 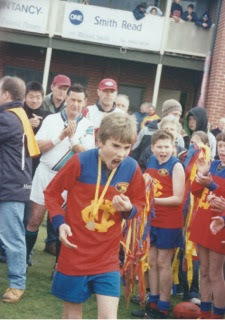 uch-loved and much-missed John Dunton, Jules and the boys (and a few girls as it happens) went on to win a premiership a few years later in the Under 12 Greens. These days Jules is also pretty happy to be playing at a club with such strong women’s squads and thinks it’s fantastic they receive so much support. But, above all, he loves playing with his mates, especially given the fact that a large number of them have known each other and played together for a long time. 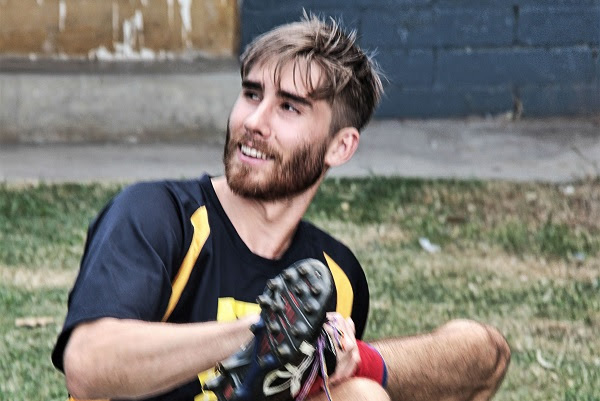 Jules has gone on to play 100 VAFA games for Fitzroy performing at his consistently high level in some massive wins and some ignoble losses on the way to notching up his ton late last season. It’s a reflection of the esteem in which Julian is held that he’s been elevated to the leadership group. This week we celebrate his football genius, courage and longevity when the Roy Boys hit the Brunswick Street Oval for the first time in 2017. Come down and see a dead-set star in action! Six of Fitzroy’s seven teams are at home this weekend with the Seniors and Reserves set to light up Brunswick Street for the first time this season. Peninsula Old Boys had a rude awakening in their first Premier B game last week, as Old Brighton Grammarians flexed their muscle and defeated the home side by over 90 points. 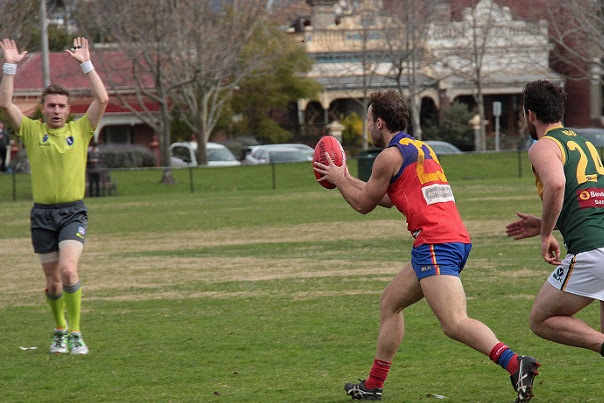 This weekend the Pirates travel to Brunswick Street Oval for the second time in just a few weeks, having warmed up again Fitzroy in a pre-season game. Having won its first game of the season for the first time in a long time, Fitzroy will be keen to make it 2-nil. It will be a big day at Brunswick Street Oval with the first pre-game lunch in the community rooms and the Anzac Day wreath laying ceremony at half time. As is tradition, the Fitzroy Senior Coach, Nick Mitchell, will be the guest speaker and it will be interesting to see how he is going about shaping this new, young team with heaps of potential and enthusiasm. A new feature at BSO this season will be three rounds brought to us by the Major sponsors of the club. Round 2 will be the Royal Derby Game, thanks to the team down at the Derby and we’re keen to have a big crowd along to help boost the community feeling at the game. If you’d still like to book in for lunch there are some seats available so please book now online. Of course, everyone is welcome back to some extended post-game celebrations in the community rooms after the game. The bar will be open until late and there are expected to be plenty of Fitzroy players and faithful present. Fitzroy will follow tradition by holding the annual laying of the wreath at half time during the Senior’s game at Brunswick Street Oval, to commemorate Fitzroy’s fallen for Anzac Day. As part of the short service, we will acknowledge the fallen former Fitzroy players, with wreaths laid at the war memorial backing onto the Bowls Club (facing the oval) at approximately 3pm. All members of the community are encouraged to join us for the short service. Fitzroy has some poignant history it commemorates every year for Anzac Day, accompanied by the reading of a letter from a former Fitzroy player and digger Jack Cooper (135 games between 1907 and 1915), who died in France in 1917. Umpires, put your hands up! Fitzroy and the VAFA are looking for more field umpires given the expansion of the competition and the women’s competition this year. Fitzroy will need to nominate another club-appointed umpire and we’re looking for volunteers. Although it’s not quite voluntary… the VAFA will pay you $80 per game. The VAFA will provide training. So if you’re fit, want to be involved in football, resilient and would love to run around blowing the whistle, please make contact with Sharon Torney, or fill in your details here: http://www.fitzroyfc.com.au/volunteers. You will require a current Working with Children check as some of the Under 19 players are under age. We know you’ve been waiting for it… Kerry will have the BBQ fired up tomorrow with some of her signature burgers and kransky’s on offer. Don’t miss out! Did you know Fitzroy Football Club was a Good Sports accredited club? The government-funded program, run by the Australian Drug Foundation, works with local sporting clubs around the country to build a healthier sporting nation. As part of this program, the club has alcohol management, safe transport and a smoke free policies which the Board reviews annually. 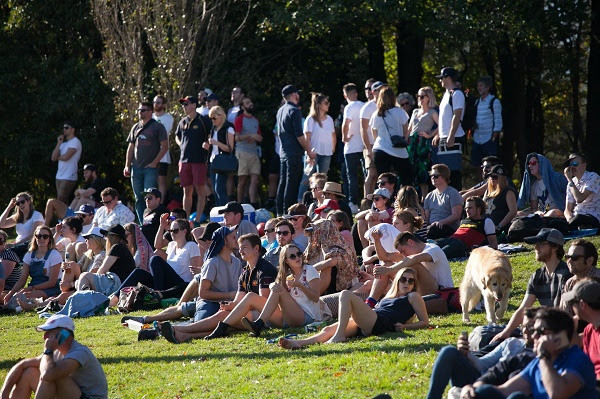 The Alcohol Management Policy relates very much to our ability to hold a liquor licence and run events, all the while making sure the safety and wellbeing of patrons is a priority and alcohol is served responsibly. The policies have now been published on our website and we’d encourage you to take a look. Fitzroy-ACU Women 2 vs Melbourne University – Women’s Grading Group 1 – Ramsden Street Oval, 2.00pm, Saturday 22 April. Copyright © 2017 Fitzroy Football Club, All rights reserved. You are receiving this email because you opted into our newsletter from our website.